This rustic one bedroom is located directly on the beach. This is a true beach house. This home has a brand new kitchen and outdoor hot/cold shower! This home sleeps 5 people with sofa bed and cot. Everything is fully furnished with towels, linens and everything you would need. The only things you need to bring are your clothes and food! There are kayaks and bikes to enjoy as well! This cottage is one of the most romantic spots for our private and on a huge beach property! This is the perfect getaway for any occasion. You’ll have free wifi, cable TV and free parking, The vineyards (wine tasting) and farm stands are right around the corner. There’s a five star restaurant only steps away that boasts a tiki style bar where you can relax with a refreshing drink. This home is surrounded by the beach and a nature reserve. It’s a great beach town community. Only minutes away from the Tanger Outlet Mall, East Wind Day Spa, Atlantis Marine World, Splish Splash Water Park, Long Island Skydive, and so much more. It is only 25 minutes away from the Hamptons, Greenport and Shelter Island. Hello let us introduce ourselves, we are Virginia & Debbie. Partners in life as well as Beach House owners and managers of these amazing properties. about seven years ago we found our dream on the beach in Wading River. It was a little beach house that needed a lot of work although you would never no that now looking at it lol. When we both decided we should rent here and there some weekends etc.. we both were worried about letting people in our home but now we absolutely love sharing our beautiful beach house and meeting such fabulous people. Our neighbors caught on to us and asked if we could help them and so on, and so on and so on... now we are up to about twenty five homes and loving every minute of it. We have the best locations and everything you would need to enjoy your stay! A five star restaurant right down the street, just walk over and enjoy an amazing dinner or just a drink. what about the fact that most of our homes come with kayaks, bikes and fishing poles to better enjoy your stay on the beach.. Fantastic beach house for 2! This is out third year in a row that we stayed at the Joyce. My mom and I love it here! Debbie & Virginia treat us like family. 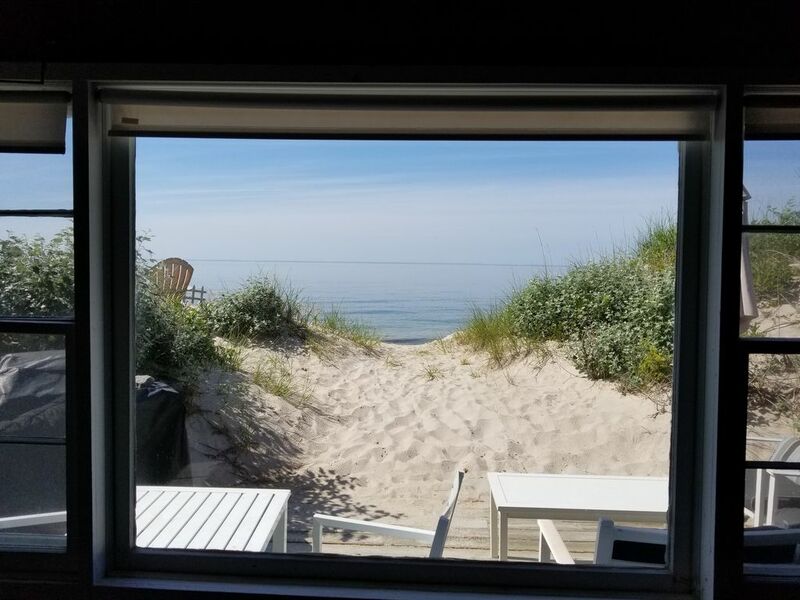 The cottage is right on the beach with beautiful views of the LI Sound. The cottage is also pet friendly so our dog can come with us. If you are looking for a beach vacation, I would highly recommend! We can't wait to come back! The property was beautiful and Debbie and Ginny were very lovely.. If you want a peaceful place to stay this is it.. Loved staying here for my husband and I's wedding anniversary. The restaurant down the block, La Plage, is amazing! A must try! I've stayed in numerous different houses along this road and am always happy.